The seed of love and truth. 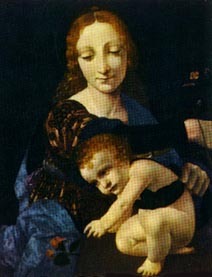 The fecund, bountiful, loving mother. The nurturing aspect of the anima. The Empress is the fertile, life giving mother reigning over the bounty of nature and the rhythm of the world. The Empress is pregnant, actively generating life, while the High Priestess is the consecrated virgin, the field ready for planting. The High Priestess is the Veiled Isis, while the Empress is Isis Unveiled. The High Priestess is undifferentiated cosmic subconscious; the Empress is activity in the subconscious mind, gestating the idea-seed planted by the personal self. The Empress is Venus, the warm mother Goddess; the High Priestess is Diana, the cool virgin Moon-Goddess. Simple Pleasures. Key 3, the Empress, reminds us that a walk in the woods can bring more comfort than our more complex, obsessive entertainments. "Dalet," the Hebrew letter for Key 3, means door. This has many connotations. This is the same passage manifested as a bridge in Key 2. Both are links to the higher realms; they are a "plexus," a "siddhi," or a "revelation." Dalet is a "Double Letter," with two sounds. 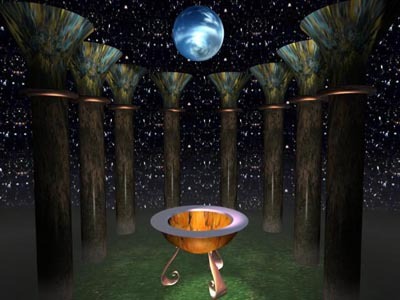 The Empress's door has also been compared to the womb, as the gateway of life; the prenatal epoch is for most people the source of dim memories of an Arcadian, perfect world, an Avalon, a bower of bliss, a sundappled, sheltered glen. The door is also self protection, sequestering, storage, conservation, and development. This is the door of the house in Key 1. The door leads both in and out; this shows connection to the travel suggested by the camel in Key 2. EAST, the direction assigned to Key 3 on the Cube of Space, is the direction of sunrise, the Doorway of the Sun, and the Birth of the Day. The Empress is Gaia, or Mother Nature - she is the same woman opening the lion's mouth in the Strength card, and she is the woman in Key 17. 3, the number of the Empress, is the number of "conditions," or "states" that the 4 elements take in the Zodiac. The Empress (3) and the Emperor (4) work together to create 12. 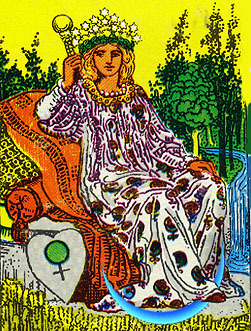 The Empress holds her arms in the "coagula/solve" position - meaning "coagulate (or join) - and "dissolve." The "coagulation" is a drawing-in of energy. The "solve" is the use of the energy to dissolve, or cut like a laser. Keys 0, 1, 3, 4, 11, & 15 share this symbolism. The Empress wears a crown of 12 stars. Crowns appear in Keys 2, 3, 4, 5, 7, 11, 14, 16, Keter,and Malchut. The Venus symbol is on a heart-shaped shield by her throne. She sits in a fertile and productive garden, the Earthly Eden. It is the same as the garden in Key 1. Her scepter is topped with the globe of this world. The waterfall at her side is the same water that flows from the robe of the High Priestess, the stream of consciousness. A waterfall symbolizes penetration and receptivity, the power of falling water and the calm acceptance of the pool. Cypress trees, sacred to Venus, grow in the background. The ripening wheat in the foreground is sacred to Ceres, the corn-earth Goddess, and to Hathor (ATOR), the Egyptian harvest Goddess. Her blond hair shows the radiance of prana, life-breath, and her wreath is of Myrtle, also sacred to Venus. Her seven pearls are gifts of Neptune. "And a great portent appeared in heaven, a woman clothed with the sun, with the moon under her feet, on on her head a crown of twelve stars; she was with child..."
The feminine character of the Empress is nature, patterned, flowing, billowy, and nurturing. Key 3 intersects with Key 2, whose High Priestess symbolizes the the dark side of the feminine, the chaos, and the cthonic grinding in the deep bowels of the Earth, the lunar feminine flux. Until recently, it was believed that all chaotic systems were invariably subject to entropy; that is, ever increasing disorder. With the ability to crunch huge numbers that came with computers, it was realized that there is another kind of chaos: Deterministic Chaos - apparent chaos that reveals patterns over time and space, meaning that with enough distance, the apparent disorder of water molecules in the ocean is seen as ripples or waves, or that after time, a repeating scenario is seen as part of a larger historical pattern. The Empress is the generatrix of ideas, the multiplication of images, the subconscious matrix from which arise new concepts and mind-forms. This multiplication is shown in the wheat growing in front of her; each seed head represents an exponential increase from the original seed of that plant. There is endless multiplication, repetition, and self-similarity in nature, because space/time is fractal. The fractal's convolutions are the folds of the Empress Mother's blankets. 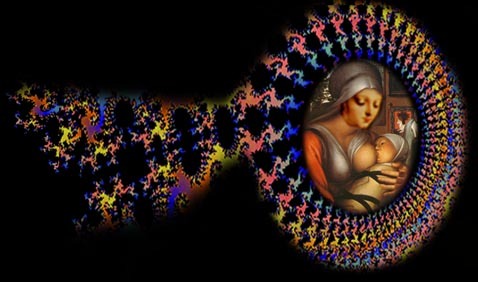 She also has control over sequence of development (gestation - Fallopian billows), another key component of the fractal - a mathematical representation of the mind of Creator. 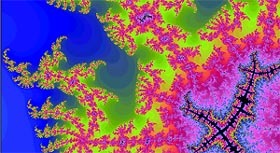 Natural patterns are fractal; fractals are "Chaotic Systems." They reveal patterns in apparent chaos; they "gestalt" a confusing miasma of numbers and show infinitely complex and beautiful patterns. 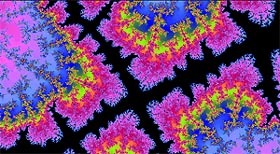 The fractal begins with a "seed" formula, then develops through re-iteration; the same formula is repeated millions of times, the results of each operation fed into the next one. This is called a feedback loop. 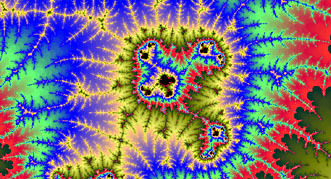 The perimeter of the fractal is a graph of all of the equation results. 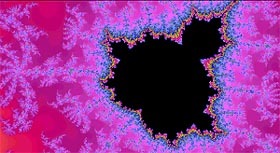 Here is the "Mandelbrot Set," meaning the basic equation before any iterations, or "magnifications." 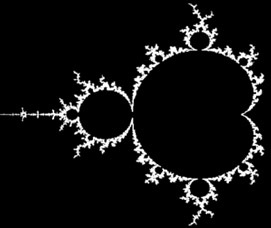 The image above is a graphic depiction of this: "the Mandelbrot set is the set of complex numbers c for which the function does not diverge when iterated, i.e., for which the sequence f(0), f(f(0)), etc., remains bounded in absolute value." Wikipedia can explain it. 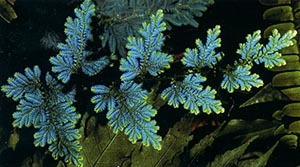 The fractal exhibits certain features. It has self similarity over time and space. It has strategic dependence on initial conditions, where a tiny difference at the Seed Level, at the very beginning of the process, can make immense differences after development, repetitions, and re-iterations. It has infinite depth; it can be enlarged forever without losing detail. 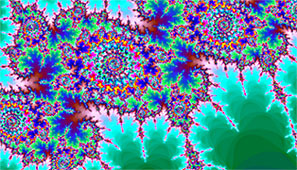 A fractal is a finite area with an infinitely long perimeter. Fractals, and nature, are "attracted" into their patterns by mathematical versions of our Symbols; they are "power points" or "gravity wells," that influence the final form of the pattern. Our symbolic belief systems, dreams, archetypes, and personal associations are the same thing. They inform our lives, affecting us as much as we affect them, and help to create the fractal of our personalities, souls, and life stories. Fractal geometry is related to the Fibonacci Sequence, discussed with the Phi Ratio, in Tipharet. Paul Tillich,The Dynamics of Faith. Symbols express what is beyond words. Through means of the symbol, there is revealed hidden light from the concealed life of the Infinite that illuminates from within.... One could say that all of creation is only a language, a symbolic expression of that level which cannot be apprehended by thought... the entire world is thus a symbolic body, within whose concrete reality there is reflected the divine secret. The Empress is a doorway to the Symbolic realm, the way to transcend the content and merge with the form. She is "relaxing into" a symbol, a dream, or an event, and using its dissonance to create new strategies, and harmonize with it. Key 3 balances, or offsets the shadow, Key 2. She copes with the unpredictability, the confusion, and the seeming deception and disorder of the High Priestess, the Kali aspect of the Goddess and the Universe. She is the feminine that rules by virtue of her stamina, determination, and ability to deal with chaos (i.e. child rearing). The wheat stalks are also a reference to the parable of the Loaves and the Fishes (Matt. 14:16); the multiplication of five loaves of bread to five thousand, an example of a powerful symbol, a metaphor about the infinite availability of Spirit. This example demonstrates the cognitive dissonance, or "oddness" of a symbol that works, because it teases us into thought. The symbol juxtaposes discordant ingredients and forces us to extract a new vision of the original elements. Symbols allow us to contact and work with the unconscious realm, Key 2, and the Shadow, Key 15. "What we call "nature" is only the maximum structure into which all material elements have entered, and nature is a work of love because it means the generation or creation of some things inside others, the birth of one from another in which it was preconceived, preformed, virtually contained." Ortega y Gasset, Jose. Meditations on Quixote. New York: N.W. Norton and Company, 1961. Rites of passage and transformation rituals often follow a pattern of descent into chaos (Key 2) and a subsequent re-ordering of the world. This is the same as the order emerging from chaos in the fractal, and the same as the cauldron's boil bringing forth the finished product. The Empress shows the process of bringing order out of the High Priestess' testing thicket of confusion. Venus' placement at birth sets the character for the person's receptive capacities, of the ability to bond with others. It shapes the way our emotions work; it shows our artistic abilities, our abilities at tact, our way of expressing affection, and who we are attracted to. Venus infuences the love nature. Afflictions to Venus create troubled love-life or friendships, or hamper the ability to enjoy life. 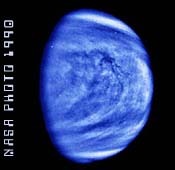 Venus takes 224 days to complete it's orbit through the zodiac. Well-aspected Venus can bring comfort and beauty. Venus with difficult aspects can be miserable. When she is powerful, she can overcome less fortunate energies in a chart, or lend softness to a bad situation. Venus is Exalted in Pisces, and Rules Taurus/Libra. Venus' detriment is Aries/Scorpio and its fall is Virgo. The Sepher associated with Venus is Netzach.